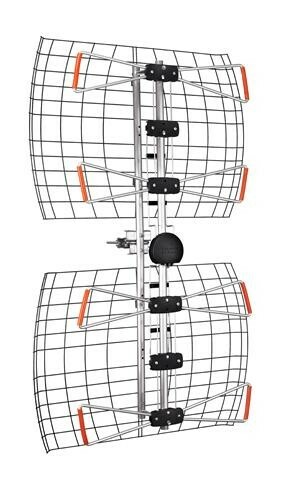 The DB4e performs and comes in the same class as a 8 bay antenna and half the size. The DB4e is the strongest multi-directional antenna in the world. The redesigned mesh reflectors now give a front to back ratio of greater than 18 dB. The unique bowtie design that is exclusive to our DBe series of antennas provides solid UHF performance. By using triangular elements instead of rods, the DB4e has a massive increase in bandwidth allowing it to cover the entire UHF band.